Low mound-forming, New Zealand native ground-cover with intertwining, brown-orange branches and very small, needle-like, olive green leaves. Blue berries are formed when plants of both sexes are present. Occurs naturally in coastal areas throughout New Zealand. Prefers a sunny position in well-draining soil. Excellent ground-covering, low-maintenance plant with an unusual wiry texture that contrasts beautifully with large, shiny, and/or smooth foliage (e.g. flaxes, Astelia, Arthropodium). Great for coastal gardens and hot, dry areas. Variegated cultivar of the natural hybrid Coprosma x kirkii, a New Zealand native, ground covering plant. The tiny leaves are green with a cream margin, resulting in a grey overall appearance. Tough, mat-forming, woody plant. Prefers a sunny or lightly shaded position in any well-draining soil. Drought-tolerant once established. Suitable for coastal or exposed conditions. Good for erosion control on banks. Frost hardy to about -12 deg Celsius. Requires very little attention other than an occasional trim to keep the plant low and dense. In my city Coprosma x kirkii 'Variegata' is a popular ground covering plant in public spaces, such as gardens of car parks, where it is successfully used to form a dense, tidy looking, light grey mat that helps to keep the weeds down, thus reducing maintenance requirements. Perennial ground cover with heart-shaped leaves and sprays of small, rosy-red flowers in spring. The green leaves have a reddish tinge when young, turn more red in autumn and may persist as brown-red foliage during winter. Grows relatively slowly, spreading with underground rhizomes. Prefers a moist, but well drained position in partial or full shade. Keep moist when young. Once established, Epimedium x rubrum tolerates dry conditions. Old leaves are best removed in spring or earlier so that the young foliage and flowers are better visible. Apply mulch or compost after removal of the foliage. Can be propagated by division. Excellent ground cover for shady, dry areas such as beneath trees. Make sure to water the plant regularly until it is well established. Mine took a while to start growing, and at some point I thought it had died, until the young leaves emerged again in spring. Fine-textured, mound-forming, evergreen perennial, native to Mexico, Venezuela, and Central America. Flowers profusely from spring to autumn, and all year round in mild climates. Thin, wiry stems with small narrow leaves, 1-4 cm long, three-lobed or without lobes. Yellow-centered, daisy-like flowers, 2 cm across, with white petals, turning pink with age. Naturalised in many parts of the world. Regarded as an unwanted, invasive weed in several countries, including New Zealand, Portugal, and New Caledonia. Happiest in full sun or partial shade, and any well-drained soil. Copes with full shade, but lacks vigor and produces fewer flowers. Tolerates moderate frosts, coastal conditions, and drought once established. Self-seeds. If you wish to propagate this plant from an existing one, all you need to do is place a pot with potting mix next to the existing plant, and Erigeron karvinskianus will do the rest. Versatile ground cover plant that grows almost anywhere, and flowers during most of the year. Particularly suited to cottage-style gardens, but also fits in beautifully with other themes, adding a delicate, somewhat playful touch to formal settings. Perennial with deeply cut leaves and masses of blue-violet flowers from spring until well into autumn. Individual flowers are about 5-7 cm across. Winter-dormant. Forms a wide-spreading, dense mound. Grows well in full sun or partial shade. Any reasonable soil, including sandy and clay soils. Can handle some drought, and also copes well with occasionally very wet soils. A trim every now and then may be required to keep the plant compact. Geranium 'Rozanne' grows vigorously, but will not become invasive. Generally pest and disease-free. Does not self-seed. Frost-hardy. Fantastic groundcover with an incredibly long flowering season. Very easy to grow. Looks fabulous with yellows and oranges, or with purple flowers like those of Liriope muscari. Evergreen, trailing shrub in the daisy family. Behaves as a climber when given support. Woolly, lime-green, rounded to ovate leaves with entire margins, 3.5 x 3.5 cm, emitting a mild licorice scent when crushed. Rarely flowers with insignificant creamy white flowers in late summer. The South African species Helichrysum petiolare is more vigorous and has become an invasive weed in several areas of the world, including New Zealand. The cultivar 'Limelight' won the Royal Horticultural Society's Award of Garden Merit in 1992. Prefers partially shaded position in any well-drained soil. Will also grow in full sun or shade. Drought-tolerant once established. Usually pest-free, but may be affected by powdery mildew. OK for coastal gardens. Prune at any time of the year to keep tidy and compact. Tolerates light to moderate frosts of about -7 to -1 degrees Celsius (USDA zones 9-11). Looks great when combined with dark green, bronze, or burgundy foliage. Also suitable for large containers. Clump-forming, evergreen, relatively slow growing perennial with palmately compound leaves and nodding flowers during winter. Native to Greece, Turkey and around the Black Sea. Leathery dark green leaves with 7 to 9 coarsely toothed leaflets, 15-25 cm long. Flowers (5-8 cm across) resemble single rose flowers, and are held above the foliage in loose clusters. Colours range from pure white to pink or dark red, often spotted. All parts are poisonous. Sap may cause skin irritation. In cold climates, Helleborus orientalis is semi-evergreen. Most hellebores sold as Helleborus orientalis belong to a large group of hybrids, now collectively known as Helleborus x hybridus. Many of the latter have their own name. For example, the stunning deep red flowers in the close-up photograph belong to the hybrid Helleborus 'Anna's Red'. Prefers partial or full shade and moist, well-drained neutral or slightly alkaline soil. Tolerates drier conditions once established. Dislikes being disturbed, so may take a while to recover after transplanting. Naturalises in suitable climates. Plants are propagated from seed or by dividing large plants in late summer. Old, unsightly leaves can be removed in autumn before the flowers and new leaves appear. Great ground covering plant for shady gardens. Since the flowers are quite subtle and delicate both in colour and size, they are best used en masse in smaller areas. The leaves contrast beautifully with hostas or ferns. Suitable as cut flowers, but flowers last longer when you allow them to float in a shallow bowl of water. Evergreen herbaceous perennial, endemic to New Zealand, named after Dutch botanist Madame Libert. The specific epithet 'peregrinans' is derived from the Latin word for 'to wander', and alludes to the fact that Libertia peregrinans spreads via rhizomes from which new leaves emerge. Stiff, upright foliage, arranged in fans. In full sun, the leaves are predominantly orange in colour, intensifying during the colder months. In partial shade they are olive green with shades of orange or copper, and in full shade the foliage is green. Flowering in spring with panicles of white flowers, 1-3 cm across, followed by green barrel-shaped capsules, gradually turning orange, yellow or black. Libertia peregrinans used to be widespread in New Zealand along the coast and margins of swamps, but has declined due to changes in (and/or loss of) its natural habitat. Is is however very common in cultivation. A position in full sun is best for the brightest foliage colour, but will also grow happily in partial shade. Any well-draining soil. Tolerates wind and dry conditions. Suitable for coastal gardens. Very easy to propagate by means of division. Frost-hardy to about -12 deg Celsius (Zones 8-10). Looks great when planted in groups, making a bold, bright statement, in particular during winter. Libertia peregrinans spreads easily by itself, so if you wish to contain it in a particular area in your garden, make sure you remove the new tufts of leaves (including their roots) that spring up at various distances from the mother plant. Evergreen, clump-forming, herbaceous perennial, native to East Asia, where it occurs as an under-story plant in forests. Glossy, dark green, grass-like, arching leaves. 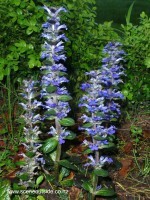 Flowering in summer and autumn with small purple flowers, tightly packed in erect spikes. They resemble the flowers of the grape hyacinth, Muscari, hence the specific epithet. Fibrous roots, often with small tubers. Several cultivars are available, including a white flowering form and a variegated cultivar. Liriope muscari prefers a sheltered position in partial or full shade, and any well-draining soil. Tolerates sun, drought, and coastal conditions. If leaves turn brown in winter, they can be cut back (or mowed) before the new foliage appears. To propagate, divide the plant and replant straight away. Generally disease-free. Hardy to about -15 deg C.
Excellent choice for under-planting en masse. Neat edging and ground cover plant. Suitable for containers. Combine e.g. with lime-green foliage plants, ferns, spring-flowering bulbs, or hostas.